You stumble awkwardly out of the sterile lighting of your padded cell, helplessly bound in an asylum straightjacket. The twenty or so hulking, deformed monstrosities swarming the hallways immediately ahead pause to look up from mutilating the scattered bodies of their victims and lock their horrible, dead eyes on you. A prompt flashes to the right of your screen: Hold the Left Bumper to run. I kid you not, this is the situation the next chapter of Dead Space tosses you into literally within the first twenty seconds of the game. EA’s flagship of the horror genre returns with equally copious amounts of exhilaratingly intense action and brutal, gory scares. Silent protagonist and reckless power-tool toting engineer Isaac Clarke returns as the unlikely hero in this futuristic thrill ride, only now he’s decided to ditch the “silent” part in favor of greatly expanding on his character and its tumultuous psychological struggles. Clarke and his terrifying saga have returned tenfold, improving on nearly every aspect from the original title. The shocks come faster and harder. The remarkable action sequences beautifully skirt the line between cinematic storytelling and nerve-fraying dexterity tests (How well can you shoot the fuel cell off a gunship while the twenty-foot Tormentor tries to tear you apart in a vacuum?) The zero-gravity puzzles bend your mind in a new dimension. And the violence just grows more deliciously grotesque. This is no game for the faint of heart. This isn’t even to mention the hilariously fast-paced and entertaining co-operative engine the multiplayer modes have become. Wander off alone for more than a nanosecond as a human and expect to soon decorate the walls of the encompassing room. Sadly, however, Dead Space 2 could not have added so many incredible improvements to its horror formula without suffering at least a few small drawbacks. The bursts of action are incredibly fun and it’s very nice to place a personality inside that air-tight engineering suit, but it clutters what truly made the original scary. 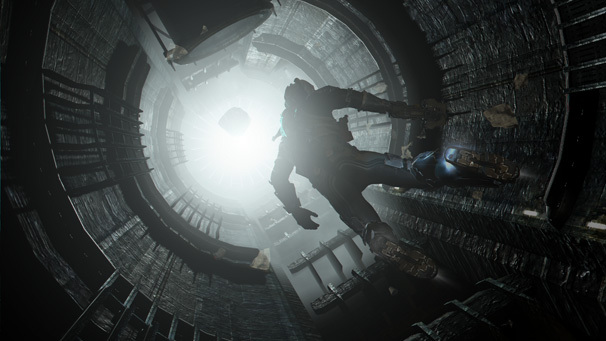 Dead Space‘s hook was the absolute and oppressive loneliness. Sure, there were other survivors, but you would only see them perhaps once an hour via a static-strained hologram. The other ninety percent of the game was spent slowly wandering alone through the pitch-black, blood-splattered metal hallways, hearing only the dull clunking of your boots and Isaac’s ragged breathing bouncing off the tarnished confines of his helmet. That alone is what set you up to jump straight out of your chair when the screaming Necromorph smashed through the vent and pounced on you.